Ah Winter. Scarves, boots, cups of tea, funky jumpers, steamy breath mornings and dark, early nights. But what is this Winter Solstice we speak of? Come to think of it, what is a solstice? What is an equinox? Why is this important and how does it relate to your life? Well, lets take a walk back into both astrology and Pagan Mythology (stay with me, it’s fun!). As the sun and earth travel around in the beautiful pattern of their orbits, every year we have a time when the sun is further north and when it is further south. This defines our seasons and obviously is opposite between the southern and northern hemispheres. There are two solstices- Summer Solstice when the sun is further south and we have the longest day of the year, and Winter Solstice, when the sun is more to the north and we have the shortest day of the year. The equinoxes fall in Spring and Autumn, when the balance of day and night is roughly equal. That’s the science. Now to the fun stuff. 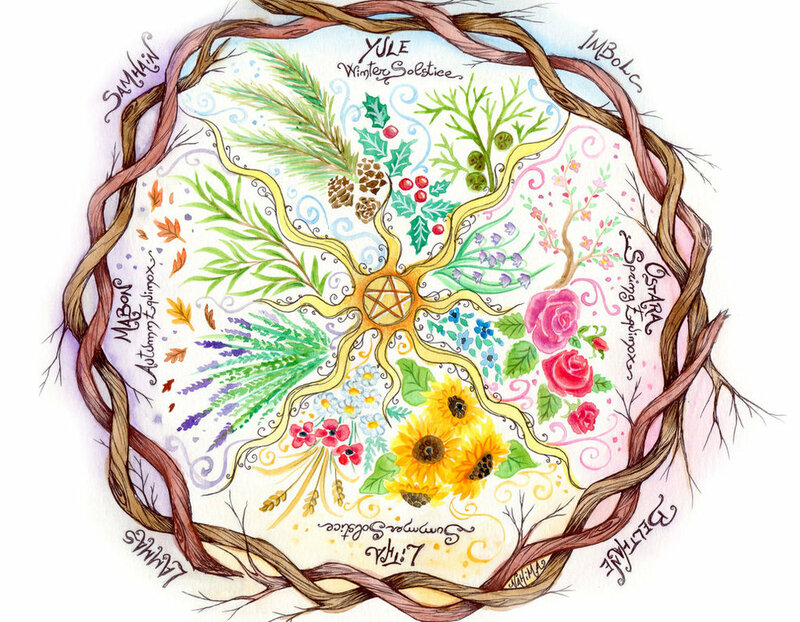 Our ancestors saw the rise and fall of the seasons and how it mirrors the progression of birth, growth, decline and death in our own lives, to be repeated over and over in a beautiful cycle. Every year in mid-winter, the Goddess gives birth to a son who grows to become the God. The Goddess appears to him in springtime as a young maiden and together they create a new life. Through the vibrancy and bounty of summer they live together, growing in beauty. Come autumn the God ages and slowly dies, entering the period of rest and reflection of Winter, when the God is reborn to begin the cycle again. Very nice, but how does this relate to the people of 2017? No matter how far removed we may be from nature, nature does not forget about us! Our bodies unconsciously follow the cycle of the seasons. Do you find yourself filled with joy and optimism come springtime? Do the short days of winter find you unenthusiastic to leave the warmth of your bed? Our bodies are attuned to this natural rhythm and if you recognise and honour this annual cycle, you may be surprised how much more ease you find in your life. Winter is the time of rest and reflection. Take care of yourself, cut down your engagements, embrace any emotions that rise to the surface, gather family and friends close. Then in the darkest moment when the night is longest and we long for the sun for return, we celebrate the Winter Solstice. That midway point of the year passes and slowly but surely every day forward we feel new life stirring. The days slowly become longer. Light returns. We emerge from our rest period renewed and refreshed, ready to embrace the period of action and rebirth as we herald in the spring. This year, the winter solstice falls on Wednesday the 21st of June. If you are looking for ways to bring this Solstice energy in to your life or for more information in general, join in our group Meditation this evening (Tuesday 20th) at 6pm, where Carol will bring in the unique energies and share more knowledge with you. May you all have a blessed Yule and we look forward to seeing you more as the days grow brighter!